Although my readers come from all over (even Kuwait, if you can believe it,) I try to keep an eye out for businesses and services that are of interest to my local readers here in Albuquerque. One of my most interesting findings so far is The Urban Store, at 3209 Silver Ave SE. Kathy and Chuck promote all things having to do with sustainability. Their mantra is “Grow, Eat, Return.” Grow good healthy local food, eat it, and return whatever’s left to the soil in a clean and usable form to grow more food and keep the cycle going. When I first looked around the shop, I said to Kathy “You have all the stuff that really works.” After tiresome (and expensive) experimenting, I’ve found a lot of “green gadgets” that work and a lot of others that don’t. At the Urban Store the experimenting has been done for you, which will save you considerable time and money in the long run. 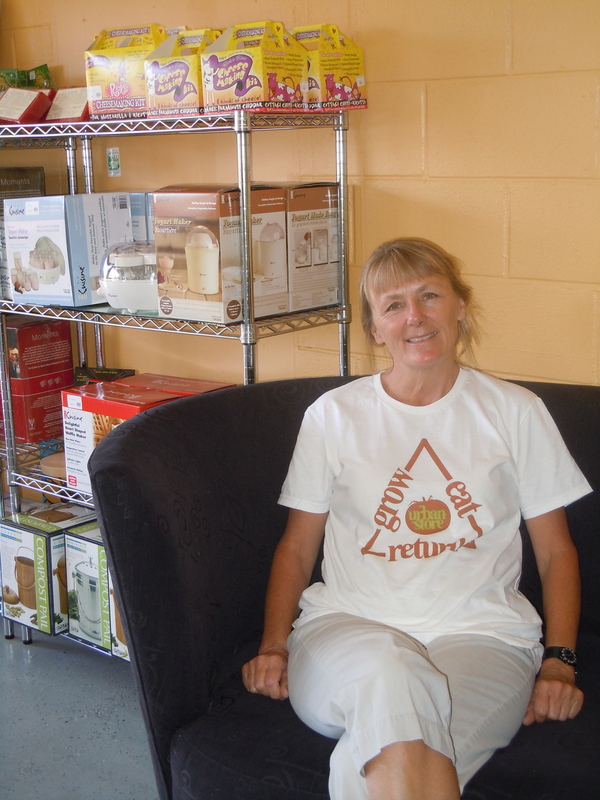 They carry the Naturemill Composter, as well as a great variety of less high-tech composting systems. They have the books written by experienced people who actually know their stuff, and they don’t have the glossy but inaccurate ones thrown together to capitalize on the current fads. 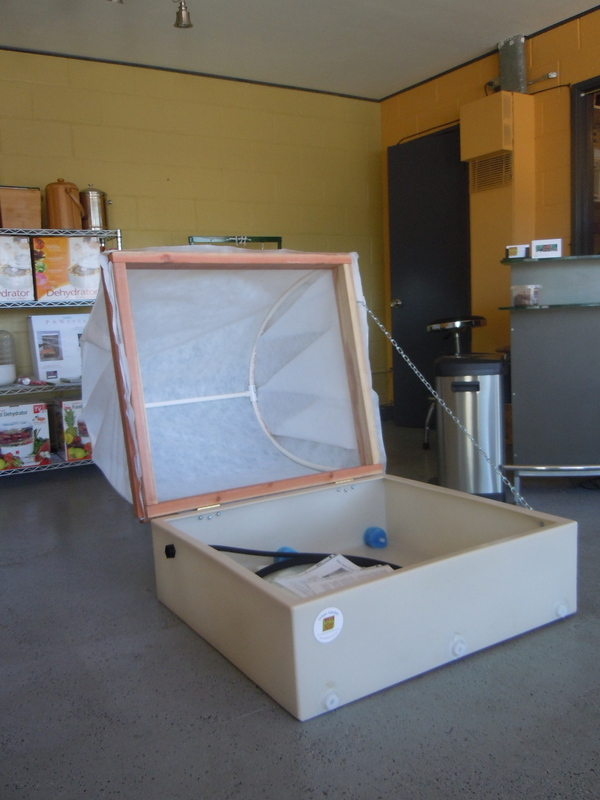 They have dehydrators and yogurt makers and cheesemaking supplies and kits to make organic wine and beer. They have an assortment of really well-crafted gardening tools, and shelves of bulk seeds, vermicomposting setups and solar ovens and lots more. Now here’s the stuff that fascinates me: they work cooperatively with Desert Plastics, a local firm, to make rainbarrels and a wonderful micro-vegetable garden called the Urban Garden. 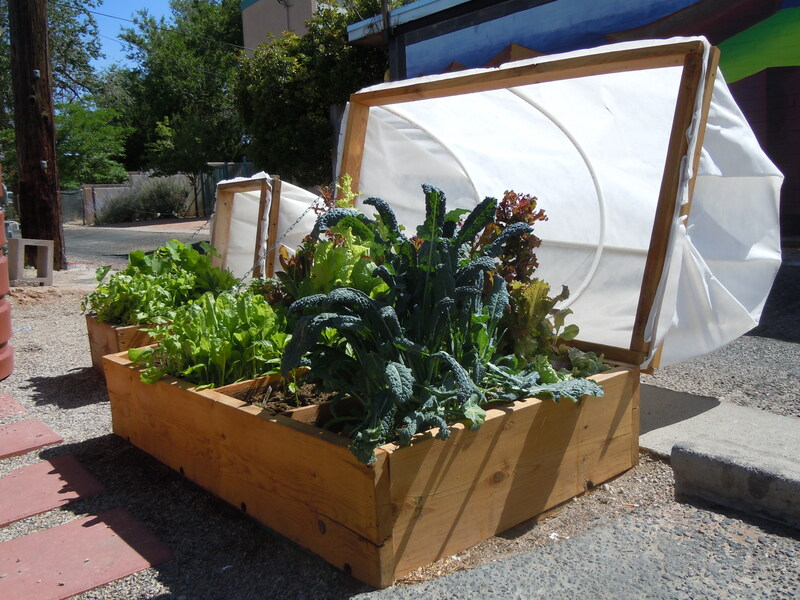 This device, shown below, enables anyone to grow vegetables anywhere. It is cast from resin with UV inhibitors, and comes in 21 colors. It has its own drip system and drainage, and comes with 2 covers for protection from cold or blistering sun. The components are 100% recyclable. It is lighter and more durable than wood (which they also sell.) You can buy just the garden for $295, or for $400 they will deliver it to your site, fill it with organic soil, plant it with seeds for the veggies that you prefer, and give you some organic bug treatments and lots of training in how to micro-garden. The Urban Grower can make a garden out of a patio, balcony, or hard piece of ground that would be too much trouble to dig. They also carry rainbarrels, both stock and custom, and at next week’s Coop Tour they will be debuting a cast resin chicken coop. I’ll be there to take a look, because a chicken coop that’s easy to clean would hold a lot of appeal for me. This store places a lot of emphasis on teaching, and in fact they will come to your site to consult on how to do whatever sustainable project you want to do. I won’t use the term “green business,” because that has become a tired and overused marketing phrase with little meaning. Instead, I refer to “good businesses,” the sort that enrich our community and allow us to live better than we could without them. This is a good, even a great, business. You can visit them online, but it will be more fun to stop in and talk with them about how you’d like to make your life a little more sustainable. Whatever you have in mind, odds are that they already know a lot about it and can help you. And have fun! Ultimately, all this is not about giving-up in a grimly austere spirit. It’s about pleasure, and about how much you can have, and how good you can feel about what you do.